If unfamiliar traffic signals leave you feeling like a deer in the headlights, you might want to boost your traffic signal IQ. 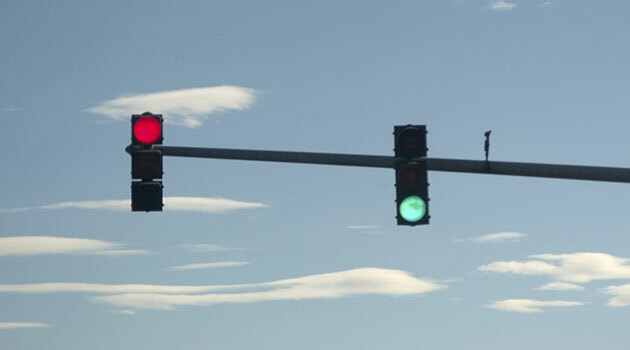 When you fully understand the traffic signals you encounter on the road, you stand a better chance of driving safely and avoiding traffic citations. Read on to learn the meaning behind basic traffic signals. Steady red lights signal a stop. When approaching an intersection, you must stop before the pedestrian crosswalk. In some states, you can turn right after stopping at a steady red light. You might also turn left if you are turning from one one-way street onto another. Consult your state's driver handbook for more information. Keep in mind that, even if you can turn right or left on red, you must always give pedestrians the right-of-way. Steady yellow lights signal that the light will turn red soon. So, you must either come to a safe stop before the crosswalk, or, if you can't stop safely, proceed with caution through the intersection before the light turns red. Remember: Uou can still receive a traffic ticket if the light turns red while you drive through the intersection. A yellow light doesn't necessarily mean "Hurry!" Steady green lights mean you can proceed, assuming you can do so safely. Before you drive ahead, ensure no posted signs prohibit your crossing. Also, keep your eyes open for pedestrians and other drivers ahead. When a steady green arrow appears at the same time as a steady red light, you may proceed in the direction of the arrow after yielding to pedestrians and other vehicles that might have the right-of-way. A flashing red light means come to a complete stop, then proceed when you can. A flashing yellow light means proceed with caution. If you still find yourself puzzling over the posted rules you see on the road, consider taking a road sign practice test to refresh your knowledge. After a few practice tests and a thorough reading of your manual, chances are you'll feel much more confident behind the wheel. How do you stay up-to-speed on the rules of the road? Tell us in the comments section below.